In these astrological portraits of celebrities, few have experienced the “roller coaster ride of fame” like Elizabeth Taylor. After the debacles of Cleopatra, seven marriages and the latest “tell-all book”, you wonder how she managed to keep it all together. When Liz Taylor’s Pisces Sun is expressed, her deep purple eyes widen as her face softens and rounds. Expressions change fluidly as she emphasizes with her surroundings and the other people around her. When her lunar emotions were riled, Taylor’s temper became sharp and intense–and even venomous at times, especially when her desires weren’t fulfilled. Fortunately, this Moon gave her compassionate Pisces Sun the determination to battle for her convictions. She may be best remembered for her valiant fight against AIDS. 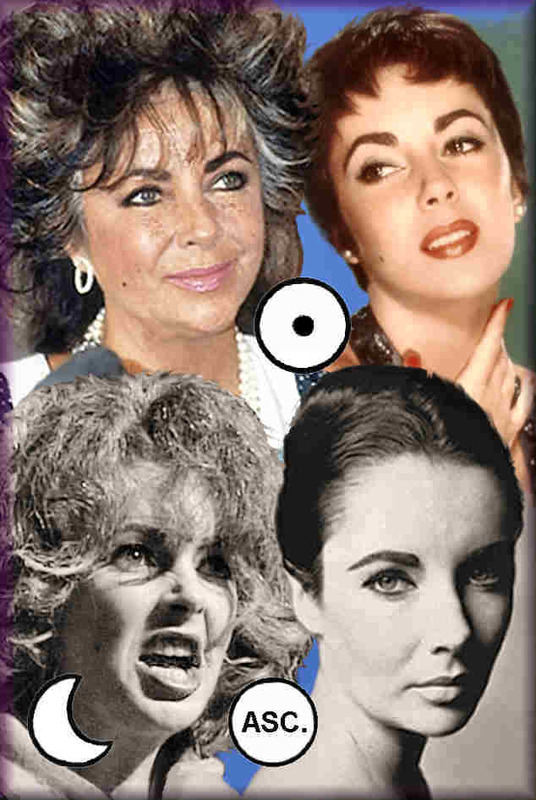 Like some of our other astrological portraits, Liz Taylor’s birth time was originally wrong. For many years, astro-data claimed that Liz Taylor had Libra Rising. Later data gave her Sagittarius Rising! To confirm the latter, just look at what happens when the waters of her luminaries recede. What you will see is the underlying bone structure with its’ domed skull and the long jaw and neck of a horse. Also, Taylor’s Centaur energies ran strong in her adolescent years, notably when she galloped across the screen in the legendary Black Beauty films. Oddly, throughout her life, Liz showed little of the humor and fire that we’d expect from a Centaur mask—even with Jupiter’s trine to her fiery Ascendant. This may have been due to her Sun’s opposition to its’ ruling planet Neptune and Venus’ square to Pluto. The joyful persona of a Centaur Ascendant was rarely seen. Since the Zodiac concludes with the sign of Pisces, we reflect on what was attempted in the astrological portraits. We hope these snapshots have helped you to understand your friends and family and it have proved worthy of your time. You can support this work by passing our site on to others, purchase one of our books or donate on the donation button below. William Schreib is now in the process of creating his new book which features over 200 Celebrity Snapshots. If you email him, he will let you know when it is completed.